...these alarm calls distract us from a more pressing problem...we are on the verge of abdicating control to artificial agents that can't think, prematurely putting civilization on auto-pilot. The process is insidious because each step of it makes good local sense, is an offer you can't refuse. You'd be a fool today to do large arithmetical calculations with pencil and paper when a hand calculator is much faster and almost perfectly reliable...and why memorize train timetables when they are instantly available on your smart phone? Leave the map-reading and navigation to your GPS system; it isn't conscious; it can't think in any meaningful sense, but it's much better than you are at keeping track of where you are and where you want to go. Many of the self-avowed introverts she meets in the course of this book, which combines on-the-scenes reporting with a wide range of social science research and a fair bit of “quiet power” cheerleading, ape extroversion. Though some fake it well enough to make it, going along to get along in a country that rewards the out­going, something precious, the author says, is lost in this masquerade. Unchecked extroversion — a personality trait Cain ties to ebullience, excitability, dominance, risk-taking, thick skin, boldness and a tendency toward quick thinking and thoughtless action — has actually, she argues, come to pose a real menace of late. The outsize reward-seeking tendencies of the hopelessly ­outer-directed helped bring us the bank meltdown of 2008 as well as disasters like Enron, she claims. With our economy now in ruins, Cain writes, it’s time to establish “a greater balance of power” between those who rush to speak and do and those who sit back and think. Introverts — who, according to Cain, can count among their many virtues the fact that “they’re relatively immune to the lures of wealth and fame” — must learn to “embrace the power of quiet.” And extroverts should learn to sit down and shut up. Altering the oxytocin receptor gene enhances perception of anger and fear. A peripheral hormone and central neuromodulator, oxytocin influences a variety of social and affective processes including affiliative behaviors, care-giving, and stress reactivity. Intranasally administered, oxytocin has also been implicated in specialized components of social cognition, such as trust, envy, and mentalizing...One way oxytocin may influence behavior is through anxiety reduction; intranasal oxytocin has been shown to have anxiolytic effects on brain systems supporting affective responses to negatively arousing stimuli. These findings support oxytocin’s role in anxiety reduction and make it an attractive candidate in neurobiological models of psychiatric disorders...Methylation of 5′-Cytosine-phosphate-Guanine-3′ (CpG) dinucleotide pairs in DNA is a highly investigated epigenetic modification that may influence behavioral phenotypes. DNA methylation within the promoter region of OXTR is variable within the population, and methylation of specific OXTR CpG sites reduces transcription of the gene. High levels of OXTR methylation at these same sites have been associated with autism, callous unemotional traits, and anorexia nervosa, suggesting the utility of OXTR methylation as a biomarker of phenotypic variability. In humans, the neuropeptide oxytocin plays a critical role in social and emotional behavior. The actions of this molecule are dependent on a protein that acts as its receptor, which is encoded by the oxytocin receptor gene (OXTR). DNA methylation of OXTR, an epigenetic modification, directly influences gene transcription and is variable in humans. However, the impact of this variability on specific social behaviors is unknown. 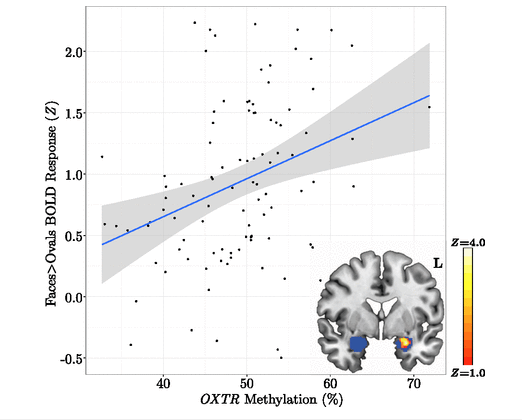 We hypothesized that variability in OXTR methylation impacts social perceptual processes often linked with oxytocin, such as perception of facial emotions. Using an imaging epigenetic approach, we established a relationship between OXTR methylation and neural activity in response to emotional face processing. Specifically, high levels of OXTR methylation were associated with greater amounts of activity in regions associated with face and emotion processing including amygdala, fusiform, and insula. Importantly, we found that these higher levels of OXTR methylation were also associated with decreased functional coupling of amygdala with regions involved in affect appraisal and emotion regulation. These data indicate that the human endogenous oxytocin system is involved in attenuation of the fear response, corroborating research implicating intranasal oxytocin in the same processes. Our findings highlight the importance of including epigenetic mechanisms in the description of the endogenous oxytocin system and further support a central role for oxytocin in social cognition. This approach linking epigenetic variability with neural endophenotypes may broadly explain individual differences in phenotype including susceptibility or resilience to disease. Individuals with increased methylation of OXTR display elevated amygdala response to angry and fearful faces. Mean Z statistic values are plotted against percent OXTR methylation for each participant (n = 98). Gray shading indicates 95% confidence interval around the best-fit line. (Inset) Z statistic map of voxels shows significant main effect of OXTR methylation depicted in MNI space (y = 0), FDR corrected at q less than 0.05. Region of interest is depicted in blue. I pass on the following brief lucid piece by Jay Rosen.You might also have a look at Peder Zane's "In the Age of Information, Specializing to Survive." A machine learning system that over time gets to know your interests and priorities and filters the world for you in a smarter and smarter way. Amazon uses systems like that. Here's the best definition of information that I know of: information is a measure of uncertainty reduced. It's deceptively simple. In order to have information, you need two things: an uncertainty that matters to us (we're having a picnic tomorrow, will it rain?) and something that resolves it (weather report.) But some reports create the uncertainty that is later to be solved. Expert listening to music alters gene transcription...So? ...the up-regulated genes are primarily known to be involved in the secretion and transport of dopamine, neuron projection, protein sumoylation, long-term potentiation and dephosphorylation. Down-regulated genes are known to be involved in ATP synthase-coupled proton transport, cytolysis, and positive regulation of caspase, peptidase and endopeptidase activities. One of the most up-regulated genes, alpha-synuclein (SNCA), is located in the best linkage region of musical aptitude on chromosome 4q22.1 and is regulated by GATA2, which is known to be associated with musical aptitude. Several genes reported to regulate song perception and production in songbirds displayed altered activities, suggesting a possible evolutionary conservation of sound perception between species. We observed no significant findings in musically inexperienced participants. To be sure, primitive first steps such as these are useful, but it is unfortunate when their popularization by blogs vying for attention proceeds to overinterpretation and hyperbole. ...let me be as clear as I can be about something that seems murky indeed: this period doesn’t represent a version, no matter how perverse or extreme, of politics as usual; nor is the 2016 campaign an election as usual; nor are we experiencing Washington as usual. Put together our 1% elections, the privatization of our government, the de-legitimization of Congress and the presidency, as well as the empowerment of the national security state and the U.S. military, and add in the demobilization of the American public (in the name of protecting us from terrorism), and you have something like a new ballgame. Alelrod et al. show that stimulation of the frontal lobe areas involved in our attentional network increase mind wandering associated with our default mode network (see previous posts here and here for discussion of these networks). Humans mind-wander quite intensely. Mind wandering is markedly different from other cognitive behaviors because it is spontaneous, self-generated, and inwardly directed (inner thoughts). However, can such an internal and intimate mental function also be modulated externally by means of brain stimulation? Addressing this question could also help identify the neural correlates of mind wandering in a causal manner, in contrast to the correlational methods used previously (primarily functional MRI). In our study, participants performed a monotonous task while we periodically sampled their thoughts to assess mind wandering. 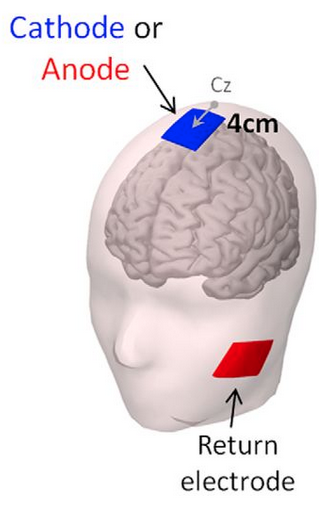 Concurrently, we applied transcranial direct current stimulation (tDCS). We found that stimulation of the frontal lobes [anode electrode at the left dorsolateral prefrontal cortex (DLPFC), cathode electrode at the right supraorbital area], but not of the occipital cortex or sham stimulation, increased the propensity to mind-wander. These results demonstrate for the first time, to our knowledge, that mind wandering can be enhanced externally using brain stimulation, and that the frontal lobes play a causal role in mind-wandering behavior. These results also suggest that the executive control network associated with the DLPFC might be an integral part of mind-wandering neural machinery. Impulse control with weak currents applied to the head - a new therapy? Spieser et al. apply a very small current (1 milliamp) using the electrodes shown in the figure to slightly hyperpolarize, or make less excitable, the supplementary motor cortex, and find that this inhibits impulsive responses in a reaction time task. To err is human. However, an inappropriate urge does not always result in error. Impulsive errors thus entail both a motor system capture by an urge to act and a failed inhibition of that impulse. Here we show that neuromodulatory electrical stimulation of the supplementary motor complex in healthy humans leaves action urges unchanged but prevents them from turning into overt errors. Subjects performed a choice reaction-time task known to trigger impulsive responses, leading to fast errors that can be revealed by analyzing accuracy as a function of poststimulus time. Yet, such fast errors are only the tip of the iceberg: electromyography (EMG) revealed fast subthreshold muscle activation in the incorrect response hand in an even larger proportion of overtly correct trials, revealing covert response impulses not discernible in overt behavior. Analyzing both overt and covert response tendencies enables to gauge the ability to prevent these incorrect impulses from turning into overt action errors. Hyperpolarizing the supplementary motor complex using transcranial direct current stimulation (tDCS) preserves action impulses but prevents their behavioral expression. This new combination of detailed behavioral, EMG, and tDCS techniques clarifies the neurophysiology of impulse control, and may point to avenues for improving impulse control deficits in various neurologic and psychiatric disorders. When two musical notes with simple frequency ratios are played simultaneously, the resulting musical chord is pleasing and evokes a sense of resolution or “consonance”. Complex frequency ratios, on the other hand, evoke feelings of tension or “dissonance”. Consonance and dissonance form the basis of harmony, a central component of Western music. In earlier work, we provided evidence that consonance perception is based on neural temporal coding in the brainstem (Bones et al., 2014). Here, we show that for listeners with clinically normal hearing, aging is associated with a decline in both the perceptual distinction and the distinctiveness of the neural representations of different categories of two-note chords. Compared with younger listeners, older listeners rated consonant chords as less pleasant and dissonant chords as more pleasant. Older listeners also had less distinct neural representations of consonant and dissonant chords as measured using a Neural Consonance Index derived from the electrophysiological “frequency-following response.” The results withstood a control for the effect of age on general affect, suggesting that different mechanisms are responsible for the perceived pleasantness of musical chords and affective voices and that, for listeners with clinically normal hearing, age-related differences in consonance perception are likely to be related to differences in neural temporal coding. By the way, the same issue of J. Neuroscience has another interesting article by Vaden et al. on noting cingulo-opercular cortical activity that predicts how well older adults recognize speech in noise. Hunger motivates people to consume food, for which finding and acquiring food is a prerequisite. We test whether the acquisition component spills over to nonfood objects: Are hungry people more likely to acquire objects that cannot satisfy their hunger? Five laboratory and field studies show that hunger increases the accessibility of acquisition-related concepts and the intention to acquire not only food but also nonfood objects. Moreover, people act on this intention and acquire more nonfood objects (e.g., binder clips) when they are hungry, both when these items are freely available and when they must be paid for. However, hunger does not influence how much they like nonfood objects. We conclude that a basic biologically based motivation can affect substantively unrelated behaviors that cannot satisfy the motivation. This presumably occurs because hunger renders acquisition-related concepts and behaviors more accessible, which influences decisions in situations to which they can be applied. What can music ensembles tell us about social cognition and interaction? D'Ausilio et al. note that most studies of how cognition and brain organization is shaped by social factors have used subjects in defined experimental settings, rather than natural ones. The problem is that experimental rigor is inversely related to ecological naturalness. They suggest that musical ensemble performance offers a promising solution for balancing the trade-off between experimental control and ecological naturalness. Here is their list of features that make music a promising avenue for social cognition research. Ecological validity: ensemble musicians participate in a socially-relevant interaction, obviating the need to introduce an artificial task, manipulation, or training to induce a social context. Motivational factors: motivation is an inherent part of music and hence it is not necessary to employ extrinsic techniques (monetary compensation, competition, or response-contingent reward) to trigger the emergence of interaction. Generalizability: musicality is a widespread human capacity, enabling almost everyone to sing together with others and to produce rhythms through body movements (e.g., simple drumming or dance). Multi-level interactivity: information transfer is both continuous (body movements) and discrete (musical sounds). Furthermore, musicians’ movements that function to produce sound on an instrument can be dissociated from those that are not necessary for sound production (e.g., ancillary movements that serve expressive functions) . These properties allow the investigation of the multi-level communicative functions (hierarchical musical structure and expressive intentions) of musical social interaction. Temporal dependencies: information transfer is not only based on the content of an individual's instantaneous response but also is affected by rhythmic timing, tempo, and the degree of interpersonal synchrony. Formal description of interaction: the musical score is a script-like description of the interaction that the experimenter can manipulate to control the emergence of social structures and different roles (e.g., leader vs follower) played by each musician. The authors briefly review research that that traverses a continuum of ecological interaction. These classes include an individual interacting with a recording, a computer-controlled virtual partner that responds to the individual, another individual in a duo, multiple individuals in mixed ensembles (extending to large orchestras), and others in the presence of a live audience. Research suggesting that political conservatives are happier than political liberals has relied exclusively on self-report measures of subjective well-being. We show that this finding is fully mediated by conservatives’ self-enhancing style of self-report (study 1; N = 1433) and then describe three studies drawing from “big data” sources to assess liberal-conservative differences in happiness-related behavior (studies 2 to 4; N = 4936). Relative to conservatives, liberals more frequently used positive emotional language in their speech and smiled more intensely and genuinely in photographs. Our results were consistent across large samples of online survey takers, U.S. politicians, Twitter users, and LinkedIn users. Our findings illustrate the nuanced relationship between political ideology, self-enhancement, and happiness and illuminate the contradictory ways that happiness differences can manifest across behavior and self-reports. • Cognitive control can be understood as an emotional process. • Negative affect is an integral, instantiating aspect of cognitive control. • Cognitive conflict has an emotional cost, evoking a host of emotional primitives. • Emotion is not an inert byproduct of conflict, but helps in recruiting control. Often seen as the paragon of higher cognition, here we suggest that cognitive control is dependent on emotion. Rather than asking whether control is influenced by emotion, we ask whether control itself can be understood as an emotional process. Reviewing converging evidence from cybernetics, animal research, cognitive neuroscience, and social and personality psychology, we suggest that cognitive control is initiated when goal conflicts evoke phasic changes to emotional primitives that both focus attention on the presence of goal conflicts and energize conflict resolution to support goal-directed behavior. Critically, we propose that emotion is not an inert byproduct of conflict but is instrumental in recruiting control. Appreciating the emotional foundations of control leads to testable predictions that can spur future research. ...according to the World Health Organization, “60% to 85% of people in the world—from both developed and developing countries—lead sedentary lifestyles”...self-relevant health messages can be perceived to be threatening to self-worth and are often met with resistance...Affirmation of core values (self-affirmation) preceding potentially threatening messages can reduce resistance and increase intervention effectiveness Therefore, one way to increase receptivity to messages discouraging sedentary behavior among sedentary individuals may be to affirm their core values in unrelated domains before exposure to the messages. We focused on the brain’s ventromedial prefrontal cortex (VMPFC) during exposure to potentially threatening health messages emphasizing the need to be more active and less sedentary in a group of sedentary adults. VMPFC is the most common region implicated in self-related processing and is also a key region, along with the ventral striatum, implicated in positive valuation of stimuli. Health communications can be an effective way to increase positive health behaviors and decrease negative health behaviors; however, those at highest risk are often most defensive and least open to such messages. For example, increasing physical activity among sedentary individuals affects a wide range of important mental and physical health outcomes, but has proven a challenging task. Affirming core values (i.e., self-affirmation) before message exposure is a psychological technique that can increase the effectiveness of a wide range of interventions in health and other domains; however, the neural mechanisms of affirmation’s effects have not been studied. We used functional magnetic resonance imaging (fMRI) to examine neural processes associated with affirmation effects during exposure to potentially threatening health messages. We focused on an a priori defined region of interest (ROI) in ventromedial prefrontal cortex (VMPFC), a brain region selected for its association with self-related processing and positive valuation. Consistent with our hypotheses, those in the self-affirmation condition produced more activity in VMPFC during exposure to health messages and went on to increase their objectively measured activity levels more. These findings suggest that affirmation of core values may exert its effects by allowing at-risk individuals to see the self-relevance and value in otherwise-threatening messages. (A) VMPFC ROI. (B) Participants who showed higher levels of VMPFC activity during exposure to health messages subsequently decreased their sedentary behavior more in the month following the scan, controlling for baseline sedentary behavior and demographics. Spontaneous emergence of shared social conventions. Centola and Baronchelli have recruited subjects from the world wide web to play a live game. They demonstate that myopic players interacting in sequential pairs in social networks can unintentionally create percolating cascades of coordinated behavior. Their findings demonstrate that social conventions can spontaneously evolve in large human populations without any institutional mechanisms to facilitate the process. The results highlight the causal role played by network connectivity in the dynamics of establishing shared norms. I pass on first the abstract and then sections on experimental design and methods. How do shared conventions emerge in complex decentralized social systems? This question engages fields as diverse as linguistics, sociology, and cognitive science. Previous empirical attempts to solve this puzzle all presuppose that formal or informal institutions, such as incentives for global agreement, coordinated leadership, or aggregated information about the population, are needed to facilitate a solution. Evolutionary theories of social conventions, by contrast, hypothesize that such institutions are not necessary in order for social conventions to form. However, empirical tests of this hypothesis have been hindered by the difficulties of evaluating the real-time creation of new collective behaviors in large decentralized populations. Here, we present experimental results—replicated at several scales—that demonstrate the spontaneous creation of universally adopted social conventions and show how simple changes in a population’s network structure can direct the dynamics of norm formation, driving human populations with no ambition for large scale coordination to rapidly evolve shared social conventions. Each live game, or experimental “trial,” consisted of a set of participants, a specific social network structure, and a prespecified number of rounds to play. When participants arrived to play the game, they were randomly assigned to positions within a social network. In a given round of the game, two network “neighbors” were chosen at random to play with one another. Both players simultaneously assigned names to a pictured object (i.e., a human face), blindly attempting to coordinate in the real-time exchange of naming choices. If the players coordinated on a name, they were rewarded with a successful payment; if they failed, they were penalized (Materials and Methods). After a single round, the participants could see only the choices that they and their partner had made, and their cumulative pay was updated accordingly. They were then randomly assigned to play with a new neighbor in their social network, and a new round would begin. The object that participants were trying to name was the same for the entire duration of the game, and for all members of the game. Participants in the study did not have any information about the size of the population that was attempting to coordinate nor about the number of neighbors to whom they were connected. Participants in the study were recruited at large from the World Wide Web. When participants arrived to play a game, they were randomly assigned to an experimental condition (i.e., a social network) and then randomly assigned to a position within that social network. In a given round of the game, two network neighbors were chosen at random to play with one another. Both players simultaneously assigned names to a pictured object (e.g., a human face), blindly attempting to coordinate in the real-time exchange of naming choices. If the players coordinated on a name, they were rewarded with a successful payment ($0.50); if they failed, they were penalized (–$0.25). (Participants could not go into debt, so failures did not incur a penalty if a participant had a balance of $0.) After a single round, the participants could see only the choices that they and their partner had made, and their cumulative pay was updated accordingly. They were then randomly assigned to play with a new neighbor in their social network, and a new round would begin. The object that participants were trying to name was the same for the entire duration of the game and for all members of the game. An experimental trial concluded when all members completed the specified number of rounds. Participants did not have any information about the size of the population nor about the number of neighbors to whom they were connected nor even about which individuals they were interacting with in a given round. We explored the dynamics of convention formation over different network sizes between 24 and 96 and degrees of social connectedness. However, the controls within the experimental design ensured that the informational resources provided to subjects were identical across all conditions of the study. •Dopamine release in mesolimbic reward circuits leads to reinforcement tied to predictions and outcomes. •Musical pleasure involves complex interactions between dopamine systems and cortical areas. •Individual variability in superior temporal cortex may explain varied musical preferences. •Cognitive, auditory, affective, and reward circuits interact to make music pleasurable. Music has always played a central role in human culture. The question of how musical sounds can have such profound emotional and rewarding effects has been a topic of interest throughout generations. At a fundamental level, listening to music involves tracking a series of sound events over time. Because humans are experts in pattern recognition, temporal predictions are constantly generated, creating a sense of anticipation. We summarize how complex cognitive abilities and cortical processes integrate with fundamental subcortical reward and motivation systems in the brain to give rise to musical pleasure. This work builds on previous theoretical models that emphasize the role of prediction in music appreciation by integrating these ideas with recent neuroscientific evidence. Hugging can make you less likely to catch a virus cold. Evidence has been accumulating recently for back and forth interactions between the brain and immune system. Brachman et al. have now made the observation that lymphocytes isolated from stressed out mice, when transferred to naive mice, reduce anxiety and depression like behaviors in the naive mice. It would be interesting to see if a similar sort of transfer in humans had the same effect. We examined whether cells of the adaptive immune system retain the memory of psychosocial stress and thereby alter mood states and CNS function in the host. Lymphocytes from mice undergoing chronic social defeat stress or from unstressed control mice were isolated and adoptively transferred into naive lymphopenic Rag2−/− mice. Changes in affective behavior, hippocampal cell proliferation, microglial activation states, and blood cytokine levels were examined in reconstituted stress-naive mice. The mice receiving lymphocytes from defeated donors showed less anxiety, more social behavior, and increased hippocampal cell proliferation compared with those receiving no cells or cells from unstressed donors. Mice receiving stressed immune cells had reduced pro-inflammatory cytokine levels in the blood relative to the other groups, an effect opposite to the elevated donor pro-inflammatory cytokine profile. Furthermore, mice receiving stressed immune cells had microglia skewed toward an anti-inflammatory, neuroprotective M2-like phenotype, an effect opposite the stressed donors' M1-like pro-inflammatory profile. However, stress had no effect on lymphocyte surface marker profiles in both donor and recipient mice. The data suggest that chronic stress-induced changes in the adaptive immune system, contrary to conferring anxiety and depressive behavior, protect against the deleterious effects of stress. Improvement in affective behavior is potentially mediated by reduced peripheral pro-inflammatory cytokine load, protective microglial activity, and increased hippocampal cell proliferation. The data identify the peripheral adaptive immune system as putatively involved in the mechanisms underlying stress resilience and a potential basis for developing novel rapid-acting antidepressant therapies. When I am trying to collect together some ideas to form a lecture or longer piece of work, I frequently think “Haven’t I seen that before?” …. and sure enough I find the ideas better put together in a previous essay I’ve done than in my current effort. I’ve just gone back and read through my 2005 web essay: MindStuff: A guide for the curious user. My reaction is the same as when last summer’s Chaos seminar group discussed the last chapter of my Biology of Mind Book. I think to myself, “Did I really write this? This is good stuff…” While there are a number of places I would tweak and update the text, the MindStuff essay still provides fundamental and useful information, particularly the “The Guide” section that starts halfway through the essay. The purpose of this post is just to point to the text.